The beauty of a relaxed Saturday is being able to choose when I am going to run and not have to worry about schedules. I wish this happened more often. Yesterday morning I was getting ready to run at 7 am and noticed it was 22 degrees. I've run in worse, but then found out it was going to be sunny and mid 40's later in the day. 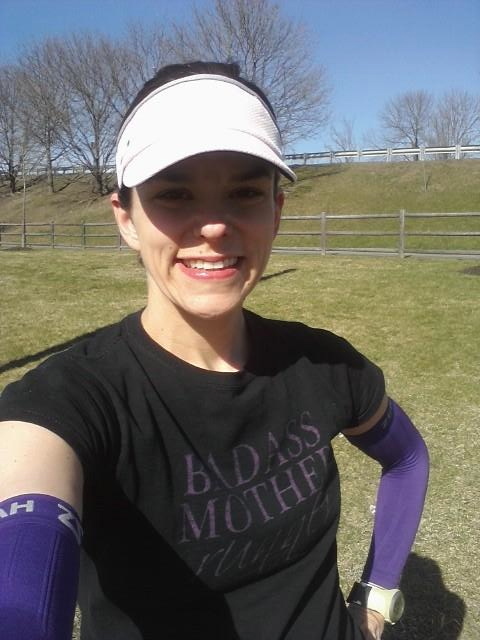 Which mean I was going to be able to run in my new arm sleeves and skirt. Of course I chose to go later! 5 miles done, in 42:00 done! 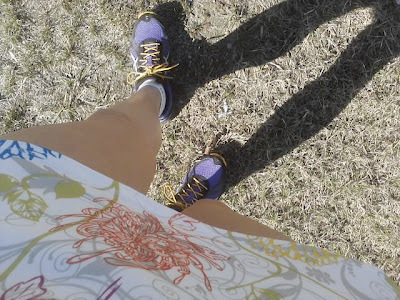 Today, was the girls regular long run day. Since most of us are running Race The Runways next Sunday, we decided that we were going to do an 8 miler this morning. A bit chilly but when there's great company, the temperature doesn't really matter. Okay - this wouldn't be my blog if I didn't boast about my awesome running husband. Yesterday, he ran his 12 miles with the guys. After that, his March mileage was 198.10. This was his highest month yet and he was quite happy with it, but the guys insisted that he go out for another 1.9 sometime yesterday. After I got back from my run and while I was preparing dinner, he went for it. This is him coming into the driveway - officially making it a 200 mile month. Way to go, Ward. I came no where near his mileage, but then again, I'm not training for Boston! My mileage for March was 128 miles! My highest month yet. What has been your highest mileage month? Does it matter to you what your mileage is? Wow!! 200 and 128... impressive. My highest mileage was just in February when I did my run streak, 70 miles. This month I thought I really lagged, but just looked at came in at 52 (which is my 3rd highest, 54 in January). I am running RTR next week too, it'll be my first 1/2 marathon. Then I'm leaving for Florida for a much deserved vacation. Upon return I'm setting my sights for my first marathon this fall, so I'm sure my monthly mileage is about to go WAY up. And to answer your question... YES mileage definitely matters to me. I like challenges, I like accountability... I like the numbers! I think you're doing an incredible job! How far did you and Trisha go today? Are you feeling ready for RTR? It's promising to be a nice day - we'll see! Rest up - you are going to rock that race. Are you doing the Maine Marathon? I'll be there as support girl for Jill, Stacy and Carrie - hopefully riding my bike along the route. Enjoy Florida! & yes, you will love seeing your mileage go through the roof with marathon training. Wow that is totally cool! You guys are doing great. Those are very impressive totals. Rest is just as important. Finding that perfect balance between mileage and rest is sometimes important. You are doing a fabulous job getting out there. You are doing quite a bit of long runs already!!! That is crazy awesome monthly mileage! I just looked mine up, and my highest ever was in January at 92 miles. I don't pay too much attention to my mileage except weekly just to make sure I'm not over-doing it. I love weekly mileage and comparing each week to the next! It is a great way to keep your mileage in check. Wow, that's an awesome month for both of you guys as far as mileage goes! Thanks Suz! We're just running fools. OK, so March wasn't "my month" I swear I was sick 3 weeks out of the freakin' month. I'm making up for it, and going to *try to push out 160 over the next coupla weeks. Cuz I'm crazy. Ouch. I hate it when sickness strikes. That was my February. Now that you are healthy and all....go rock the mileage this April! That is awesome mileage for both of you!!! :) Great job! wow 128 miles for the month is awesome...I am lucky to hit that number in 6 months! Wow! Those are very impressive numbers. Glad you had such a nice day to get out in sleeves and a cute skirt. I know I've done higher mileage than lately back when I was marathon training, but I'm thrilled that I've hit 100+ miles every month since December. I jumped from 20-30miles a month to 30 miles this past week over the past four months! Congratulations Ward!! And you too, 128 is quite impressive! My highest was March, so far, with 81. Not bad considering we are only training for a sprint triathlon right now. We'll definitely have higher with marathon training though.